Performers include Armineh Atanbous, Shirin Makaremi, Atoosa Maleki, Mobina Nouri, Narges Poursadeghi, and Bella Warda. 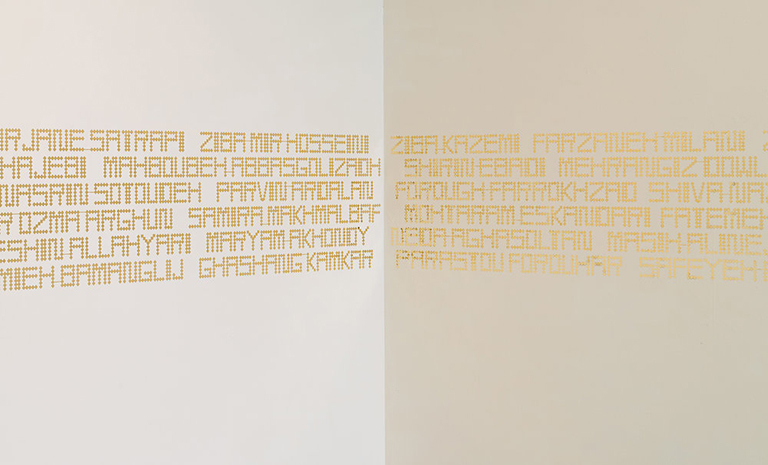 Join us in the main gallery for a special reading of exhibiting artist Tannaz Farsi's The Names, an ongoing archive naming historical and contemporary Iranian women that the artist has collected. Timed with International Women’s Day (March 8), this materialized archive attempts to create a visible and accountable document of the women’s public intellectual labor in Iran and abroad. Guests are invited to walk around the gallery as the reading is taking place and are welcome to stay for the entirety of the reading or just for part of the time. Tannaz Farsi’s practice constructs a network of relations around memory, history, identity and geography to build complexity upon expected forms of representation. Her work has been exhibited at venues including Portland Institute of Contemporary Art; Pitzer College Art Galleries, Claremont; Tacoma Art Museum; the Urban Institute of Contemporary Art, Grand Rapids; Delaware Center for the Contemporary Arts, Wilmington; and The Sculpture Center, Cleveland. She has been granted residencies at Bemis Center for Contemporary Art, Ucross Foundation, the McDowell Colony, Studios at Mass MOCA, Santa Fe Art Institute and the Rauschenberg Foundation. Her work has been supported through grants and awards from the Oregon Arts Commission, National Endowment for the Arts, University of Oregon and the Ford Family Foundation where she was named a Hallie Ford Fellow in 2014. Born in Iran, Farsi lives and works in Eugene, OR where she is on the faculty at the University of Oregon.